The past few years of iPads and HTPCs have brought about the Big Screen Revolution. As music moves from the iPod to the widescreen, no longer are we satisfied with tiny thumbnails for album art... no, we want full-on, high definition album covers! I just added the ability to bliss to find and install HD covers automatically... and now bliss will even overwrite your existing art automatically, if you allow it! 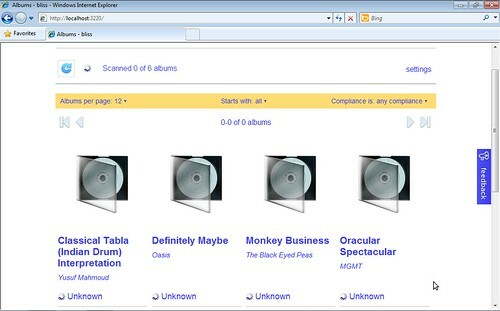 This blog post is a walk-through of how to configure bliss to find HD album covers for your music collection. If you've never assembled album art before bliss functions as an album art finder and will fill in all of your missing album art. You can tell bliss to only consider album covers that are over a given resolution, meaning you can quickly collect HD cover art. Then, all the finding and installation is completely automatic, saving you a lot of time. 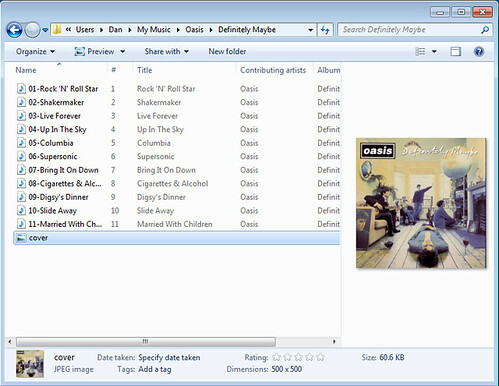 If you've already got album art, but it's too small for your liking, bliss saves time by finding larger versions of your cover art and automatically saving and embedding it into your music files. Sit back and watch the covers come in! Mac users just get a nice straight Mac Application to run. While it's downloading and/or installing, let's take a look at my music library. Here's the kind of album cover I want to upgrade to a high resolution version. 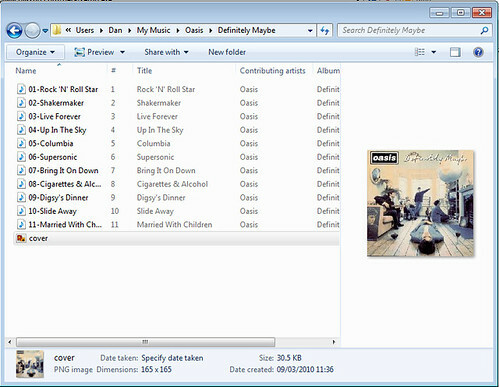 It's the album art for Definitely Maybe, a pathetic 165x165 pixels! I need to specify a rule to disallow low resolution art and to find larger, high resolution versions. First, start bliss. 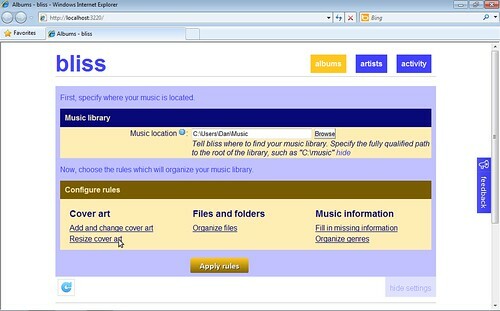 Then use your Web browser to access the bliss user interface. If bliss is running on the same computer you are running the Web browser on, you'll see a little popup and bliss will load in the system tray. Click the "Albums" link in the system tray or just go to http://localhost:3220. If bliss is running on another computer ( you can install it on your home server, for instance) go to http://[computer]:3220 replacing 'computer' with the name or IP address of bliss's host. First, enable the cover art rule by clicking Resize cover art. This opens the Cover art rule configuration. Let's configure our cover art rule. This will define the constraints bliss will apply to our music collection. I'll leave the cover.jpg setting, and because I want portable, flexible art, and I have existing embedded art to upgrade, I'll allow art to be embedded too. I'll leave the other settings, apart from the Minimum size setting which is the key to upgrading to HD album covers. It's the Minimum size setting that will upgrade our art. If I set it for a reasonably high resolution, say 500x500, bliss will fill in any missing art with art that is at least this size and assess all of my existing art. If existing art is smaller than 500x500 bliss will either upgrade the art automatically to art it has found on the Web, or it will alert me to the small art and suggest some alternatives to upgrade to. Whether it upgrades automatically or not is dependent on whether I check the Replace with larger art automatically checkbox. I want to upgrade existing art, so I'll check it. With the cover art settings complete, I'll click 'Apply rules' and bliss begins assessing, finding and upgrading automatically! Once an album has been assessed and fixed, we can check the resolution of the art that was found. Sometimes bliss cannot find art automatically (it's pretty strict about its sources) and offers a selection of art to upgrade automatically to. 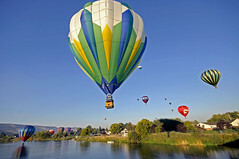 Get the latest release from the downloads page and I wish you many High Definition returns! Thanks to Dene' Miles for the image above.